History: The Black H’mong immigrated from China approximately 300 years ago. Language: The spoken language belongs to the H’mong – Dao language family. The H’mong writing was romanized in 1961 but is not widely used today. Costume: The Black H’mong women are famous for making cloth from hemp and dying it a deep indigo blue. They wear long blouses decorated with batik flowers over short trousers, and wrap long scarves around their legs. They wrap their long hair around their head and wear a blue turban. The men wear long jackets with shirts and a long waist coat embroidered at the collar, and a small hat. Today some H’mong wear Viet or western clothes. 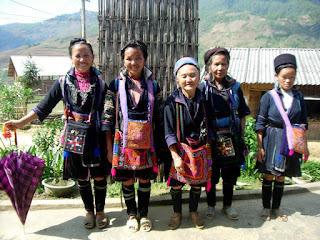 Social organisation: H’mong women are respected in their community as being equal with H’mong men. Husbands and wives are very affectionate and do many of their tasks together like going to the market, working on the field and visiting relatives. In this way, they help each other to develop a strong community life. Marriage: For the Black H’mong it is important that a girl knows how to embroider and work well in the field. These skills are more important than her beauty. Boys and girls are allowed to get to know each other before they get married. They go to the love market where they eat and sing songs together. After this time, the boy can propose marriage and if the girl agrees, she goes to live in his house. She is put in a small room and visited by the boy’s mother and sisters who give her food to persuade her to accept the marriage. Funeral: When there is a death in the family, the deceased’s children fire a gun to let everyone in the area know. People in the village come to deceased’s house with anything they have – chicken, rice, a small pig or rice wine – to help the family. Everybody sings and eats until the deceased is wrapped in a mat and carried to a grave by one group, while a coffin, which has been kept in a cave somewhere near the grave, is carried by another. Both groups have to run very fast to meet at the grave to make the deceased forget the way home. If the deceased’s family is not able to supervise the funeral rituals, they can wait for a few years before organising a special one called ma kho. They invite people in the village to a place by the grave for the funeral for a celebration, at which they sing and dance. Beliefs: Many places are reserved for worshipping in a H’mong house – there’s a place for ancestors, for the house spirit, for the kitchen spirit, even the door spirit. There are different rituals which forbid people to walk into the H’mong house or their villages. For example, a green tree branch on the front door indicates that entrance is forbidden. Artistic activities: The Black H’mong are very good at making agricultural tools, wooden furniture, musical instruments and jewelry. They are also famous for their handicraft and embroidery. They generally only make such items to meet their own needs, but other minorities in the area buy their produce because of its high quality. Since the advent of tourism in Sappa, many H’mong women make decorated cloth to sell on the town’s main streets. The Blue H’mong share the same origin as the Black H’mong. Most of their rites and rituals are the same – only their clothes are different. 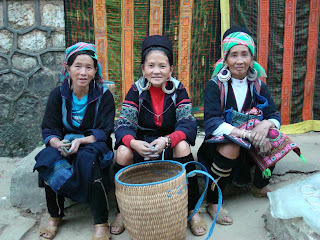 The Blue H’mong women wear long skirts over long trousers, with a blue bib worn over the top.